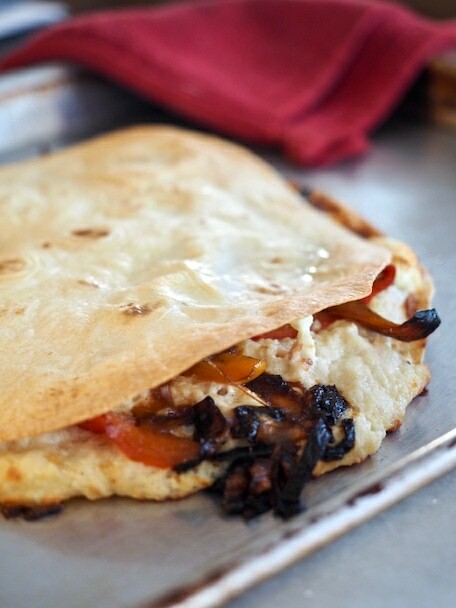 A bodacious baked chicken quesadilla bursting with caramelized peppers and onions, filled with a mixture of chicken, parmesan, goat, cheddar and cream cheeses. I love a good appetizer, in fact, I could eat appetizers for dinner most nights, I love the variety and small bites. Like these amazing cheese dips or this creamy white queso, mmmmm! Great for a family dinner, sporting event, game day, dinner party, potluck; anywhere you can use a heavy appetizer. Back in my MOPS (Mothers of Preschoolers) days, we moms were desperate for simple, filling, quick meals; whether it was for simple entertaining or for our families. We have a cookbook filled with wonderful recipes like this one; my creative and very talented friend, Allison was the contributor of this beauty. SIDE NOTE | If you have little ones (infants – preschool ages) and are not involved in a moms group, stop what you are doing and look one up, get involved. These precious woman are still in my life, encouraging, consoling, laughing, crying and praying for me. The original recipe calls for the amounts shown below, but it makes a lot, normally I’ll cut the recipe in half. I added goat cheese which wasn’t in the original recipe. Oh how I love goat cheese; creamy, filled with flavor, a slight tang…my mouth is watering. Have you tried smoked goat cheese, wowza!!! First, we’ll caramelize the peppers and onions. This is the prettiest part of the quesadilla, because after all, quesadillas in general are pretty bland looking. In fact, you can make the onions/peppers ahead of time just warm them before assembling your quesadillas. 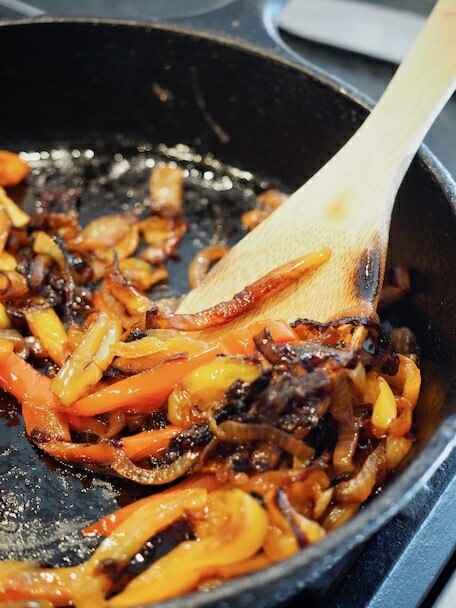 Slice your peppers and onions, pour a tablespoon or so of olive oil into a saute pan and over medium heat. Cover and cook the peppers and onions, stirring occasionally until they boast a bodacious caramelized color. You may need to turn your heat down, watch them and stir occasionally. Though a few crispies are never bad! While your onions and peppers are doing their caramel-y thing; place your softened cream cheese, rotisserie chicken, parmesan, cheddar and goat cheese (optional) in a mixer bowl (stand or handheld, either works) and mix until cheese is smooth and chicken has become part of the “batter”. Set aside until ready to spread onto tortillas. Preheat oven to 425° F. May also be made ahead of time, keep refrigerated until ready to use and bring to room temp for about 20 minutes prior to assembling the quesadillas. Once the peppers are finished and you’ve made your cheesy chicken mixture, spray the bottom of two tortillas (any size desired, mine were about 10 in) with spray oil (may be baked dry as well) and place on cookie sheet. 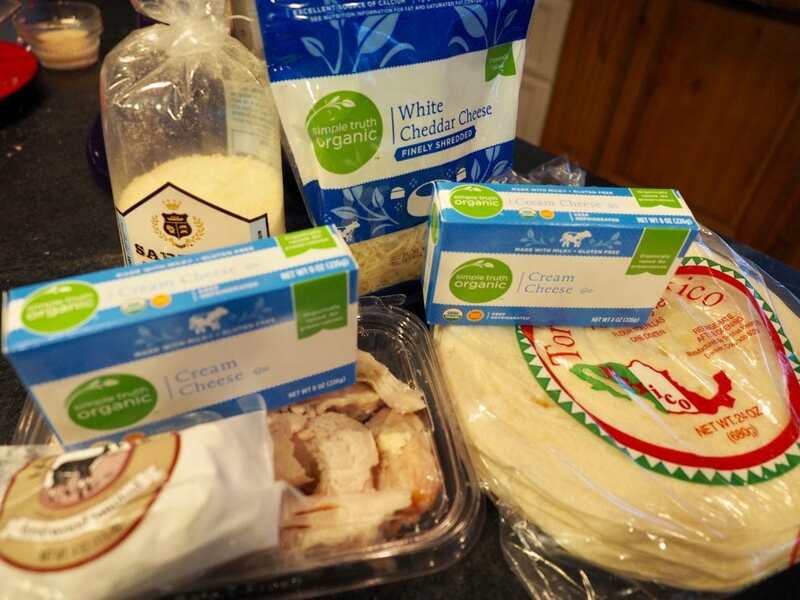 Spread a healthy ¼ – 1/2 cup of chicken cheesy mixture on top of the tortilla. TIP: I love spray Grapeseed oil, or Avocado spray oil, they are great at high heat. 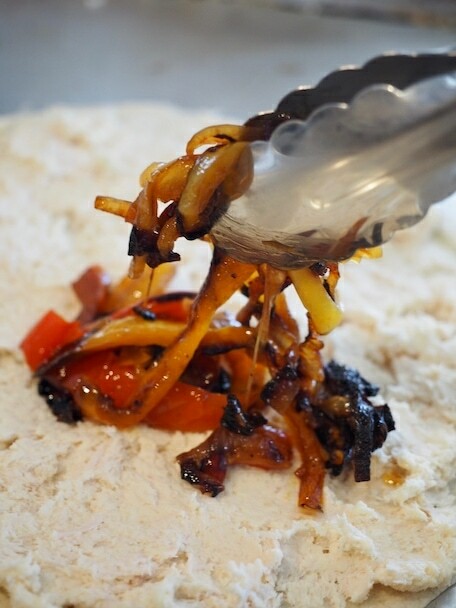 Place some of the caramelized veggies on top of the chicken mixture and spread evenly. Top with another tortilla, pressing down slightly and spray with spray oil. Bake at 425° for 10-12 minutes until crispy, cool for 1 minute before cutting. Cut into 4 or 6 triangles, I’ve found it’s so easy cutting quesadillas using my pizza cutter! Serve immediately! TIP | Quesadillas may also be baked in a skillet or griddle the traditional way, melt a little butter into a medium hot pan and sizzle until browned, turn and repeat the process on the other side. If you like this recipe, give these other cheese-y recipes a try! 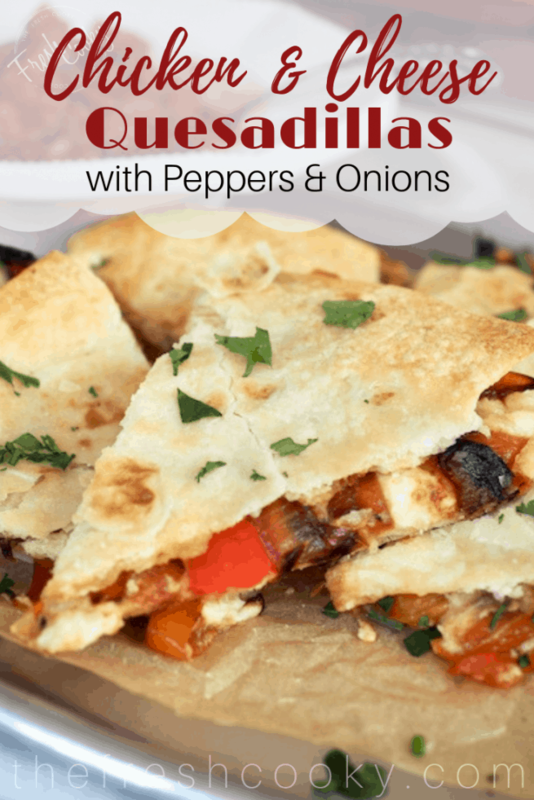 A bodacious quesadilla bursting with caramelized peppers and onions, filled with tender chicken and a mixture of parmesan, goat, sharp cheddar and cream cheeses. Slice onions and peppers. Toss in heated pan with 1 tablespoon of olive oil. Saute until caramelized and golden in color. 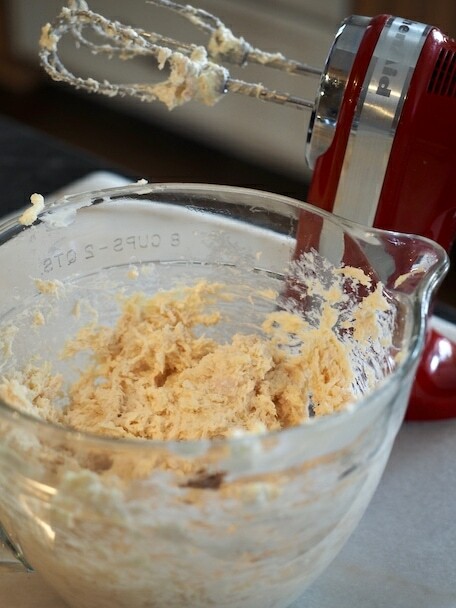 While onions and peppers are sautéing place cream cheese in mixer and beat until smooth. Add chicken and mix in, mixer will shred it to make a chicken cheesy paste. 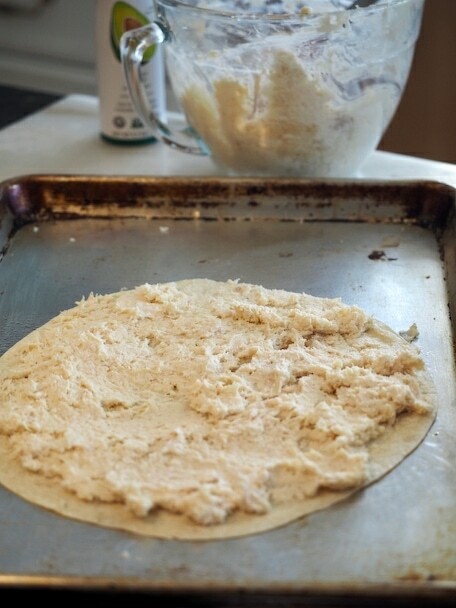 Spray the bottom of two 10″ flour tortillas with olive or vegetable oil, place oil side down on cookie sheet. Spread ¼ – ½ cup of chicken cheesy mixture on top of tortilla, not quite all the way to the edge. 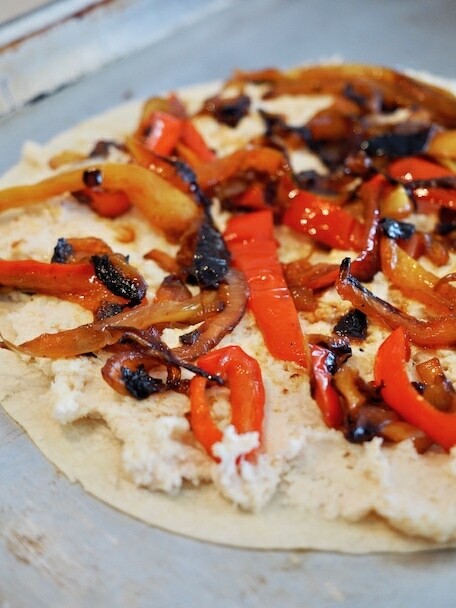 Grab some of the caramelized peppers and onions and spread evenly over the top of the chicken mixture. Place another tortilla on top of mixture, pressing down slightly. Spray tops with spray oil and bake at 425 for 10-12 minutes until crispy. May be pan fried as well, cover with lid though so that mixture is heated all the way through. 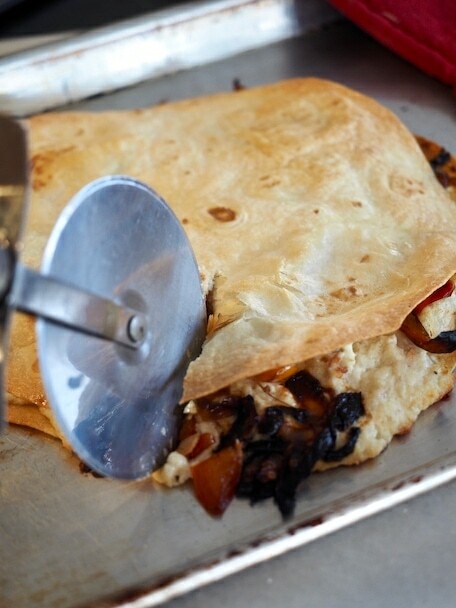 Cut into 4 or 8 triangles per quesadilla, continuing making until you’ve used all the mixture.